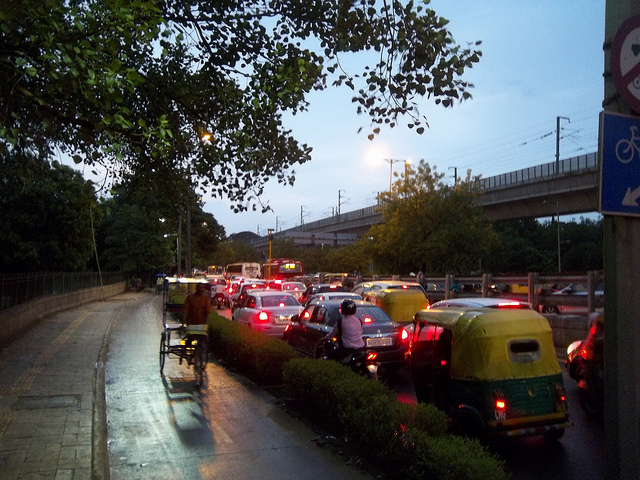 A cycle rickshaw breezes past evening congestion. Photo by V Malik. Over the last few years, the city of Delhi has seen a 20-percent decline in the use of public transport. Non-motorized transport, including cycling, makes up for 33-percent of all trips taken in the Capital. 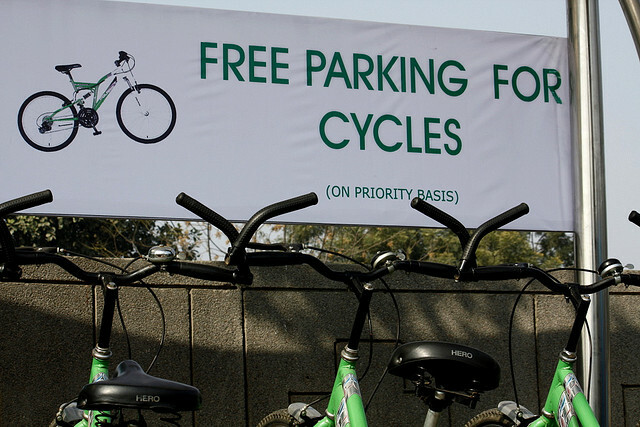 To counter the declining use of motorized transport, the Delhi Integrated Multi-Modal Transit System (DIMTS) launched the Green Bike initiative in 2010. The system consists of 5 stations on the BRT corridor and 3 stations on the metro corridor, developed on the “build-operate-transfer” framework based on a public-private partnership. Planet Advertising, a local marketing firm, was to build, operate and maintain the cycle stands at specified locations for a period of 5 years, paying a monthly fixed sum of Rs. 20,000 (about US$380) to DIMTS. In return, Planet Advertising would keep the revenue from advertising and hiring of cycles. The system currently has 13-18 cycles at each manned station. The cycles are gearless, and do not have any tracking system installed. Minor repairs and maintenance of cycles is done at the stations as well. Some stations have separate cycles for men and women, while others are unisex. Cycles can be hired for as little as Rs. 10 (about US$0.19) for up to 4 hours, and Rs. 5 extra for each additional hour. Night-time charges vary from Rs. 50-100 (about US$1-2). While this system has the potential to serve as a convenient feeder service to mass transit, there are several drawbacks that prevent expanded usage. To start with, those interested in hiring cycles have to produce photo identification documents, like driver’s licenses or passports, which will only be returned when the bike is returned. This problem is compounded by the need to return the bike to its station of origin. The placement of bike stations at a distance away from mass transit stations also places the service at a locational disadvantage. At the Delhi University metro station, for example, the bike station is over 100 meters away; beyond several waiting cycle-rickshaws, and a bus stand. It is not surprising, therefore, that Green Bike has not lived up to expectations so far. The average daily ridership is about 6 persons a day in summer, and about 15 persons during winter, as opposed to the predicted 40-50 daily riders. Green cycles in Delhi. Photo by Joe Athialy. To improve the system’s viability, Green Bike should be expanded to be a comprehensive network of cycle stands. World-over, public bicycle sharing systems do not have an optimal impact unless the system is of a certain scale. A few cycle stands in a large city will have very little impact. Additionally, Green Bike, while intending to be a cycle sharing system, is really a cycle renting system – the cycles have to be dropped off at the place of pick up, and thus, cannot be used as access or egress modes to mass transit. A recent survey of the bus rapid transit (BRT) corridor indicated that the average trip length to access the BRT is about 2 kilometres. This may prove a viable opportunity for improving “last-mile”connections that could enhance the Green Bike system’s overall appeal while improving mobility. There is both opportunity and room to improve the Green Bike system, which has the chance to improve the quality of life and accessibility of Delhi’s streets.